Creation of discord and polarity in Islamic society is now one of the main plots of the enemies, said the Supreme Leader. Supreme Leader of the Islamic Revolution Ayatollah Seyyed Ali Khamenei raised the alarm over hostile moves aimed at inciting rift in the Islamic society, and said that countering such plots requires Muslims’ insight and determination. “Creation of discord and polarity in the Islamic Ummah (society) is now one of the main plots of the enemies. Thus, all (Muslims) need to be careful lest they raise the talk of differences and turn into a mouthpiece for the enemies of Islam and the Quran,” the Leader said on Saturday. Ayatollah Khamenei made the statements in a gathering of Quran reciters and memorizers participating in the 32nd International Holy Quran Competitions in Tehran. “On the agenda of ill-wishers of the Islamic Ummah is fomenting discord in the name of Shiites versus Sunnis, Arabs versus non-Arabs, as well as ethnicities, nationalities and nationalistic zealotry,” the Leader warned, adding that insight and determination are necessary for countering these plots. Imam Khamenei further referred to “commitment to the commandments of the Quran” and withstanding what “the modern version of ignorance” is trying to impose on Muslims as remedies for the Islamic world’s current woes. 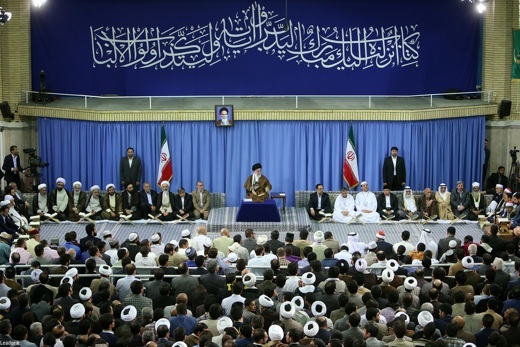 “Unfortunately, the Islamic world today is severely suffering from weakness, poverty, differences and civil wars caused by the pressure of ignorant regimes, and the only way to counter these imposed pressures in surrendering to the Quran and (having) serious determination to move towards its sublime goals,” the Leader stressed.